Boo came to Safari with “Dry Eye”, medically termed Keratoconjunctivitis Sicca (KCS). 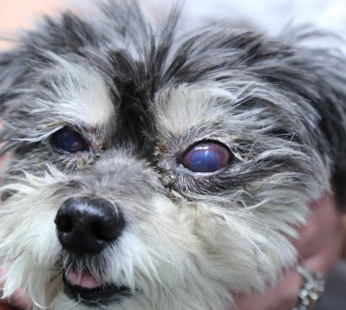 Boo is an 11-year-old spayed female Shi Tzu cross presented with a chronic history of ocular inflammation, matting of the eyes and rubbing of the face with the paws. The client complained that the pet would wake up with the eyes matted shut. Examination revealed mucopurulent crusts on the eyelids and periocular hair. Boo was relieved of her symptoms almost immediately after Stem Cell Therapy at Safari. Boo received administration of stem cells into lacrimal gland and the accessory lacrimal gland of the third eyelid. Boo was relieved of her symptoms almost immediately after Stem Cell Therapy at Safari. (KCS) is a common condition of the eye that occurs when the tear glands stop producing enough tears to keep the eye wet, or in some cases, stop producing tears altogether. Also known as “Dry Eye Syndrome” or DES, this condition grows progressively worse, slowly robbing the animal of its eyesight entirely. Your pet can be treated with stem cell injections, too! With Stem Cell Therapy, your pet’s eyes can be restored to normal function!